Among Italian designers, the Gucci name reigns supreme. From their handbags to their accessories lines, the Gucci style is authentic and unmistakable. Their famous creations have distinguished them as a fashion icon, and their newest watch collections will help to carry on that legacy. Gucci’s timeless appeal is the appropriate beginnings for one of the new watch lines. 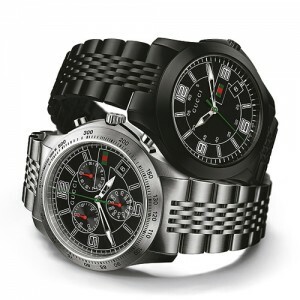 The G-Timeless Collection is a modern and contemporary compilation of men’s and women’s watches. The sizing of these watches is in small and medium. Those loyal Gucci fans will love the detailing of the G-Timeless Collection. The watch face is styled in a “G” shadowed monogram. Some of the dials feature a diamond Gucci motif, while other sportier versions offer green monochromatic webbing. The dials are presented in an array of colors, such as Gucci brown, midnight black, brushed silver, and snow white. These new Gucci timepieces are paired with either polished steel, leather, PVD, or rubber straps. The Gucci G-Timeless watches are traditionally elegant. If you are looking for the perfect Gucci watch, the G-Timeless may just be it. Recently “Friends of Gucci” got together to help launch the new line. Celebrities Owen Yap, Chermaine Poo, Joey G, and Andrea Fonseka were on hand to model the newest Gucci creations.